As a Early Bird Reviewer I've been having fun reading through Gooseberry Patches 101 Stove top Suppers. This wonderful cookbook could not of arrived on my doorstep at a better time. Right now in Texas were in the heat of summer. August is typically the hottest month, so turning on the oven on is always a challenge. Summer is the time of year when I turn to my crock pot or make skillet meals for dinner. Who wants to turn on the oven when it is already 100+ outside. Inside 101 Stove top Suppers, well you guessed it there's 101 recipes inside this spiral bound cookbook. At the end of each 101 cookbook series cookbooks you will find a nifty conversion chart, volume and weight measurements, baking pan size information, recipe abbreviations and kitchen measurements. That always comes in handy. My favorite part of the Gooseberry Patches 101 Cookbook series is that each recipe has a beautiful full color photo. After receiving this cookbook it didn't take me long to start dog earring pages and finding so many recipes that I wanted to make. Quick & Easy - Quick and simple recipes that are short on time, but big on taste. Slowly Simmered - is packed full of hearty and filling home style meals. Serves a Crowd - is a chapter packed full of recipes for when your entertaining family & friends. This chapter has plenty of recipes to feed any hungry crowd. If you love dessert you won't be disappointed, because each chapter has a pair of dessert recipes. Chocolate Oatmeal Cookies, Pineapple Pudding and Skillet Strawberry Jam to just name a few. The first recipe on my list to try was One Pot Beef Ravioli. We love anything Italian in our house, so I knew this would be a hit. This recipe utilizes refrigerated cheese ravioli, store bought spaghetti sauce and a just a handful of ingredients. One Pot Beef Ravioli comes from Sara Jose in Shreveport, LA. Sara says this is a favorite recipe of hers, because she can have dinner on the table in 30 minutes and she only has one pot to clean. Who doesn't love that? Brown beef in a dutch oven over medium - high heat; drain and set aside. Add oil to dutch oven; saute onion and mushrooms for 8 minutes or until tender. Add garlic and cook for one minute. Stir in beef, pasta sauce, water and seasoning. Bring to a boil. Add ravioli to sauce; reduce heat to medium -low. Cover and simmer, stirring occasionally, for 8 - 10 minutes until pasta is cooked. Stir in cheese. Serves 5. Here are a few photos of this easy one pot meal. This one was definitely one of our favorites. 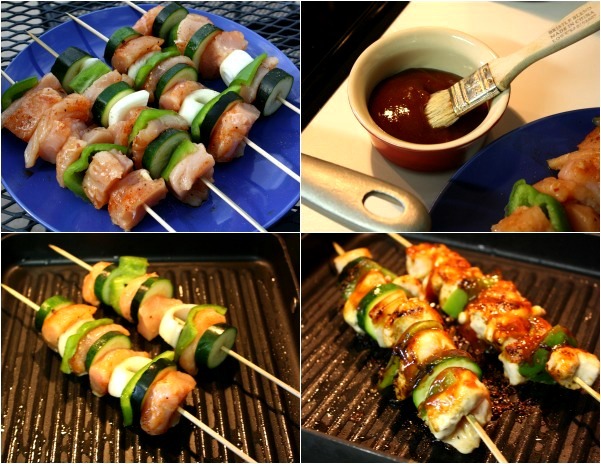 Next on the list was these easy Barbecue Chicken Kabobs. I loved that I could cook these by using my indoor grill pan instead of going out in the heat to fire up the BBQ. This was a great time saver and they tasted just like I cooked them outside. This recipe is courtesy of Robin Hill of Rochester, NY. Robin says she uses chicken that she gets from her local farmers market to make these yummy chicken kabobs. I have included a few step by step photos. The chicken browned up nicely on my indoor grill pan. Any recipe that has the icon just like the one above next to the title, means that Gooseberry Patch has created a video to go along with that particular recipe. Go to Gooseberry Patches You Tube Channel to view the video. Sometimes it makes things a bit easier to actually see how a recipe is prepared versus just reading it. I enjoyed reading through and testing out a few of the recipes from 101 Stove to Suppers. This cookbook is a wonderful addition to the rest of the 101 cookbooks that I own. If you would like to purchase a copy for yourself you can get a spiral - bound copy for $12.25 or a kindle version for $8.69 at amazon books. 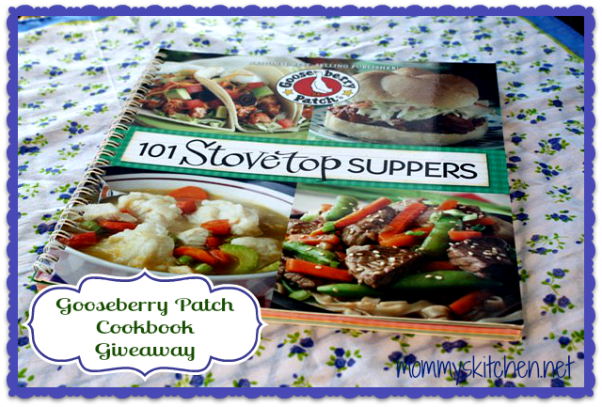 Would you like to win a FREE copy of Gooseberry Patches 101 Stove top Suppers? Well you can, because the wonderful folks at Gooseberry Patch have hooked me up with an additional copy to share with one of my readers! 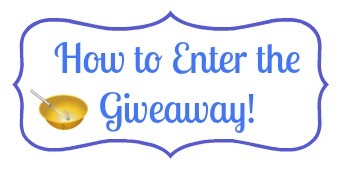 See the details below on how to enter the giveaway. Leave a comment on this post telling me what you're favorite skillet meal is? This giveaway starts today Thursday 8/22/13 and will run until Midnight (CST) on Saturday 8/31/13. Contest is open to U.S & Canadian Residents only due to shipping charges. If you leave an anonymous comment please include your email address. This way I can contact you in the event that you're a winner. Winner will have 48 hours to reply to my email or a new winner will be chosen. Good Luck! 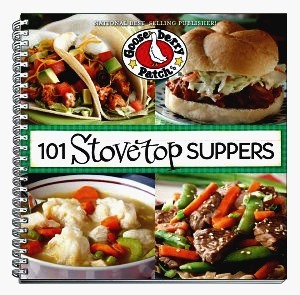 I would like to thank Gooseberry patch for providing me with 2 copies of 101 stove top suppers. One to review and one to use in a reader giveaway. Opinions stated above are 100 % entirely my own. Have really enjoyed following Mommy's Kitchen. So many good recipes. Also I love Gooseberry Patch recipe books. Always looking for recipes to make cooking more enjoyable. I make what my husbands family calls "Gravy Steak. "It's either chunks of stew meat or any thin steak cut into pieces & dredged in seasoned flour & browned. Drain most of the oil...add some flour to the drippings & make a paste & then gravy. Slice an onion into nice thick pieces and add to the gravy & add the browned meat back to the pot. Of coarse salt, pepper, & garlic are added & stewed for 45 mins. to an hour, stirring frequently. Yummy! Lately, my favorite skillet meal is hash. It's a great way to use up leftovers. My mom's stroganoff is my favorite! Mine is cheeseburger rice. It's ground beef, diced onion, rice, ketchup, mustard, and lots of shredded cheese. My family loves it! I make a one skillet pasta dish that my family likes. I already like Gooseberry Patch on Face book. Szechuan chicken and vegetables. It is 5 ingredients and 15 minutes. Perfect for a mom of 3 that works outside the home. It is called ketchup chicken. I know sounds gross but is a Chinese dish and very yummy! My family likes my skillet Hamburger Chili Macaroni. Love skillet dinners and would love some new ones. This book looks amazing, just what I need. Today, I went to facebook and liked Goosebury Patch and then I joined their family for the newsletters. My sister and I have loved these books for years. You just can't beat those gals for writing the Gooseberry Patch. My husband has been asking about a Tortilla Soup. The first one I would try is the Tortilla Stew. I am already a member of Circle of Friends. I like the tomato and chicken penne. Cheesey chicken, broccoli, and rice! Yummy! :D Thank you for the entry - I can't wait to try some of the recipes you shared. I follow GBP on FB. I'm a member of circle of friends. My favorite skillet dish is to brown chicken breasts and then add garlic Philadelphia cooking creme to make a sauce. We toss in some store bought ravioli, it is yummy and my husband loves it! I'm a fan of Gooseberry on Facebook. I'm also a circle friend. My family loves it when I make cheesy scrambled egg and hashbrown skillet dish for breakfast. It's quick and easy and sometimes I jazz it up and cut up some sausage to go in it as well. I'm originally from the south so I love skillet recipes where you can do one meal in one dish and not have a lot of clean up worry :) so I love one skillet meals! :) I love to take a round steak, brown in my electric skillet then put potatoes and carrots around it, water and awesome seasonings and let it cook on low for a long time. All the flavors incorporate and a gravy forms, oh so good!! That Gooseberry cookbook looks fantastic and the recipes are perfect! Always love to read a new cookbook. Your website has brought me many new recipes and changed our routine of preparing the same old, same old each week. I am a Circle of Friend member. I love to make homemade chili in one pot. My big skillet has been used many times for this meal. I love Gooseberry Patch recipes and I am a fan on Facebook. Would love to win a cookbook. I make skillet spaghetti that is wonderful. My favorite skillet meal is fried rice--you can change it up so many different ways depending on what you have on hand and what you feel like, and it is always filling! My favorite go to skillet meal is cheeseburger macaroni with homemade cheese sauce. My favorite "go-to" skillet meal -s a Gooseberry Patch recipe! LOL! It's "One-Pot Spaghetti." I'm a fan of Gooseberry Patch on Facebook. I joined Gooseberry Patch's "Circle of Friends." My favorite is skillet lasagna. We love to make fried rice and make it quite often. I love making chicken and pasta meals using different pasta and sauces and veggies every time! I am already a fan on Facebook!! My family enjoys a skillet stir fry meal using Chinese noodles and fresh veggies. I am already a fan on Gooseberry Patch's Facebook page. I joined Gooseberry Patch "Circle of Friends". I love skillet spaghetti and meatballs. Thanks for the chance to enter. I am a member of Gooseberry Patch "Circle of Friends". Thanks for the chance to enter. We love chili and cornbread made in a cast iron skillet. I have joined Circle Of Friends znd am a friend on Facebook. I have been enjoying Gooseberry cookbooks for a while now. My family loves our favorite goulash. It's a recipe that's easy and has been passed down for at least a few generations. I already like Gooseberry Patch on Facebook. Love the recipes. We have a go to meal when we're really busy and it's the old fashioned creamed chip beef dinner. Hubby is always happy when I make that and it only needs a skillet and a toaster for the bread. This cookbook is one of my favorite collectibles. The recipes are easy and appeal to all membrs of our family, bot young and old. I love homemade chili and skillet spaghetti. Cheesey chicken, broccoli, and rice! I like making your "City Chicken". That might not be considered a skillet meal but it is really good. Yay for Gooseberry Patch. I live about an hour away from their store and have yet to make it there :( That is going to change pretty soon though. Thanks for the giveaway. I am a member of Gooseberry's Circle of Friends. My favorite is Spanish rice! My favorite skillet dish is Lemon Butter Chicken Breasts! I am a fan of Gooseberry Patch on Face book. My favorite skillet meal is an easy Jambalaya that I make. Would love to win this cookbook...thanks, Tina! I'm also a member of Gooseberry Patch Circle of Friends. I would like to try the one pot beef ravioli......ciao4now64 at yahoo dot com. I like GP on fb.......ciao4now64 at yahoo dot com. I have joined the circle of friends too........ciao4now64 at yahoo dot com. I tweeted it here....https://twitter.com/ciaomjc/status/371789920265711616...ciao4now64 at yahoo dot com. I am new to your site and I love it. Polynesian meatballs has always been a family favorite along with goulash and swiss steak. My favorite skillet recipe is Skillet Chicken with Broccoli, Ziti, and Asiago Cheese--an America's Test Kitchen recipe. Thanks! I just signed up for Gooseberry Patch Circle of Friends. Just liked Gooseberry Farms on Facebook! I love a stir fry type skillet meal with chicken and lots of fresh veggies. My family enjoys this meal! Childhood favorite is macaroni and tomatoes. I love my potatoes, pepper, and sausage skillet dinner. Its so easy and delicious! I liked gooseberry patch on Feb.
My go to skillet meal is sausage and peppers. Family loves it and its so simple and quick. I am already a fan of gooseberry patch on FB with seaaggie95 and belong to the circle. They are my favorite cookbooks EVER! Which means something as I am one of those odd people who collect cookbooks. Love them. I'm belong to Gooseberry Patch's Circle of Friends. Our favorite skillet meal is stir-fry veggies (made with veggies fresh from the garden) and rice. I "like" Gooseberry Patch on Facebook. I'm part of Gooseberry's Circle of Friends. I'm a facebook fan of Gooseberry Patch! I've already joined Gooseberry Patch "Circle of Friends". My favorite skillet meal for my family is chicken teryaki. Love the one pot/skillet meal, so easy. Love this site and feeling blessed to have discovered it today. Will be visiting often! Thanx for all the great ideas!!! Awesome giveaway! Who doesn't love skillet meals? All the flavors in one skillet, and easy clean up! Hi Tina I love your site and everyone I cook for knows if its good it came from mommyskitchen. My family and I love spaghetti for dinner I have a difficult time turning on the oven in the summer as well. Love your site. My go to skillet meal is chicken fried rice. In Texas, I never use my oven in the hot summer. I love love my crock pot meals too. We love Skillet meals! Chicken and rice and stovetop Chicken pot pie are 2 of our favorites!!! I liked the Gooseberry Facebook page. I joined the Circle of Friends. Looks like fun!! Wish I could tweet but I'll surely pass the word. I'm SO excited to try the one pot ravioli!! I love it but hate buying the canned stuff! Already a facebook fan of Gooseberry Patch! I love your site and have had some good cookbooks from Gooseberry patch. Now my daughters enjoy the cookbooks. Our new fave is a German Skillet Dinner. A deconstructed cabbage roll! Easy and done in 30 mins. I'M NEW TO MOMMY'S KITCHEN!!! THE RAMEN SKILLET SUPPER LOOKS YUMMY--CAN'T WAIT TO MAKE IT!!!! I think my favorite is to just throw everything together with some pork or beef and gravy and of course lots of onions and garlic for an old fashion hash like Mom used to make. I like making my home made version of hamburger helper and have a mexican chicken rice that's so good. Quick easy and spee clean up. Anxious to try the.skillet ravoli recipie! I have been a fan of Gooseberry Patch for ages...I recall when their catalogs were the little 5x7 size and the sweetest most enjoyable little thing to sit and slowly go over each page! I sure miss that!!! I loved the rag quilts that were offered!!! As an economical meal when my girls were little I made a ground beef stroganoff skillet using sour cream that my family loves to this day!!! My favorite skillet meal is homemade cheesy potatoes! YUMMY!! Im a fan on faebook! I love Spanish Rice. Always a quick meal and has a lot of flavor going for it. Can be on the table in about 45 minutes, too! Love making a skillet chicken, rice & cheesy sauce. Easy one pot meal that I can add veggies to if I want. And clean up is a breeze. My favorite skillet meal is ham fried rice. I AM SO SORRY THAT I CANNOT NAME A "FAVORITE" STOVETOP RECIPE, AS THEY ARE SO MANY THAT ARE OUR FAVORITES. I REALIZE THAT I DON'T HAVEW A SNOWBALLS CHANCE IN HEAVEN, TO WIN THE COOKBOOKI, BUT I WILL STILL KEEP GETTING THESE FABULOUS RECIPES THAT YOU PRESENT TO US. GOD BLESS AND THANK YOU SO MUCH FOR BEING THERE FOR ALL OF US!! My best skillet recipe is fried rice, taught to me by my Philippine friend. Don't usually make skillet suppers, but am trying the ravioli one on this page for tonight. By luck, I've got all the ingredients. I love almost any Italian-type food! Just want to say, I "liked" the Gooseberry FB page ages ago. Have been a fan for a couple of years now and have some of the books! We like one pot chili. We like a one skillet beef stroganoff recipe I use from an old Campbell's soup cookbook. Thank you for sharing all your great recipes! I make a cabbage sausage and potato skillet meal that my husband loves. My go to easy skillet meal is sausages with home fries - easy and tasty! All-time favorite skillet family meal is beef stroganoff. Love your blog!! I love potatoes and eggs...kind of like a frittata. I make a Maccaroni grnd beef skillet, with tomatoes, peppers, and onion that is my hubby's fav. Im' 84 and have had Gooseberry's books for years. Good cooking, good eating. Can you use frozen (but thawed in the fridge) ravioli?